It’s not always easy to be full of festive cheer when tense feelings lurk beneath the Christmas tree. Family gatherings can trigger old dynamics and emotions, even when we feel we’ve personally resolved them. By responding differently, we can break patterns and turn a problem into an opportunity for understanding and connection. Apprehension and resentment can trigger our fear and survival instinct of fight, flight or freeze. When that’s the case, we may fantasise about cutting rebuttals, escape plans, or freezing someone out. But because these fantasies are driven by our survival instinct, our communication style too will reflect it and become aggressive, passive-aggressive or passive. While we can’t control someone’s reaction, or are responsible for it, we are responsible for our communication and behaviour. Which means that we too need to be aware of not dishing out emotional poison! So what can we do before and during a potentially difficult meeting? Be aware of our assumptions and generalisations: Labels hinder our perspective and project our assumptions through our communication and actions. What labels are we putting on them (e.g. narcissist, selfish, bully, victim etc.) based on generalisations about their behaviour? Let go of resentment and blame: resentment creates power games; it backfires and turns us into the persecutor. 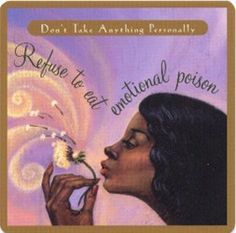 It is the emotional poison we eat and dish out. Identifying the hurt feelings and unmet needs behind our resentment, can help us communicate from a more authentic and empowered place. Consider our contribution(however improbable it may seem). There are always two sides to every story, different perceptions and unmet needs. Reaffirming our position can stop understanding and keep us stuck in blame. Change perspective, practice empathy: We’re not alone in having feelings, vulnerabilities and needs. What might theirs be about this gathering? There is a saying: “No one can make us feel anything without our choice”. Therefore, our reactions reflect a wound to be healed, as well as a boundary. When old wounds are triggered, we may lash out, sulk, leave, or say nothing. We can regain our centre by speaking assertively, with self-responsibility, in a way that honours our boundaries and also treats another with respect. By naming what our experience, its impact and making a positive request, we are moving away from blame and setting a boundary. We are responsible for our behaviour and communication that treats others with respect as equal human beings. Not for its impact. As human beings some of our wounds are made up of insecurities, self-esteem and inner battles. Because these can hurt when touched, our reaction reflects our own pain rather than being personal towards another. Knowing this can enable us to be more compassionate and seek to understand what’s behind it, even when we can set boundaries. When we realise that others are behaving based on their worldview and own wounds, we aim to truly listen and understanding. Open-ended questions that start with ‘Why’, ‘How’, ‘What’ can help de-escalate blame in their response and explore their needs further. Christmas can be a time of high-expectations and emotions. In order to not eat emotional poison we also need to take responsibility for our part and do our best in responding differently. Dynamics can change when person stops playing the game. By being aware of our own expectations, assumptions, feelings and behaviour, we can turn a potentially difficult situation into an opportunity for understanding and connection. BEST WISHES FOR A PEACEFUL FESTIVE SEASON! NEXT CONSCIOUS COMMUNICATION TRAINING JANUARY 16TH BRISTOL. If you would like to explore these themes in depth, contact me for more information or to book your place.